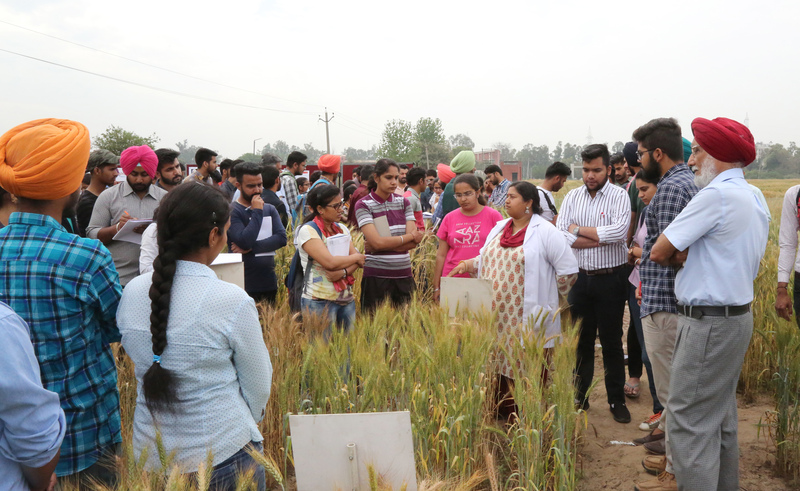 The Wheat Section of the Department of Plant Breeding and Genetics, PAU, Ludhiana, organized a walk through exhibition on “Wheat Evolution and Revolution” at Experimental area of Wheat Section on 12th April, 2019. This was the 3rd exhibition of its kind organized by the wheat scientists depicting the journey traversed by wheat crop from its evolution, through the Wheat Revolution transcending to its supreme ‘golden grain’ status. Dr. KS Thind, Additional Director Research (Crop Improvement) welcomed the students and staff. Dr. Darshan Singh Brar, Member, Board of Management, PAU emphasized that the main aim of this event is to sensitize the students about the history of wheat dating back to 5000 years. A live exhibition depicting a walk through the evolution of wheat through different eras showcased grandparents and parents (progenitors) of present day wheat that underwent natural hybridization, thus kick starting the process of wheat evolution. A walk through the progressive wheat varieties to present day cultivars will enable students to observe in detail the different characteristics of each variety and what impact it had on wheat production and food security in the country, said Dr G S Mangat, Head Department of Plant Breeding, PAU. While divulging how these tall wheat varieties with lodging problem gave way to Norman Borlaug’s Norin 10 dwarf variety responsive to fertilizers, Dr V S Sohu, Sr. Wheat Breeder, and team members explained in detail various steps and major landmarks during the history of wheat breeding both at national and international level. On display was also the improved version of classic wheat variety, PBW 343, released as Unnat PBW 343. Dr Achla Sharma briefed how this variety after succumbing to yellow rust in 2004, gave way to Unnat PBW 343 and is the first variety in the country to be released through marker assisted backcross breeding. A large number of undergraduate and post graduate students thronged the exhibition while discovering the process of evolution and revolution going hand in hand and experienced the feel of ‘learning by seeing’. Dr. Puja elaborated in detail the efforts put in by the program in maintenance and utilization of the wild relatives of wheat which are part of its evolutionary history, and the pioneering work done by PAU wheat team on various aspects of wheat breeding including doubled haploidy, hybrid wheat etc.